Bio-based polymers – polymers made from biological sources – have been around for ages. Starch and cellulose are two common examples. However, the recent trend towards sustainability has sparked a renewed interest in bioplastics. Bioplastics can be either biodegradable or non-biodegradable, so not all bioplastics are automatically environmentally friendly. According to the USDA, 300 million metric tons of traditional oil-based plastics are produced globally each year, and what doesn’t make it to landfills ends up elsewhere in our environment. Consumers’ clarion call for environmental stewardship has resulted in more companies investing in R&D to make plastics out of renewable resources. 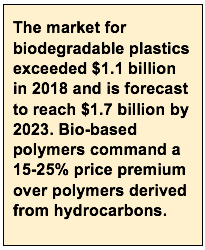 And, following the economics of supply and demand, there’s money to be made: the market for biodegradable plastics exceeded $1.1 billion in 2018, and is forecast to reach $1.7 billion by 2023. Because of this, even the big petrochemical companies have jumped on the bandwagon, because these bio-based polymers command a 15-25% price premium over polymers derived from hydrocarbons. 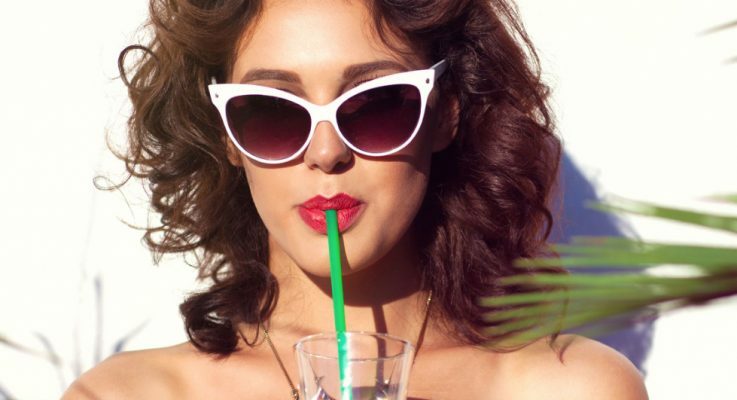 One of the newest markets with huge potential is biodegradable drinking straws. Those of us that are a certain age remember paper drinking straws from our youth, and they are making a comeback. But let’s face it; paper drinking straws just don’t hack it. I remember drinking milk through paper straws in grade school, and the straw would always collapse after about four sips. What’s a third-grader to do? Rip the flattened end off of the straw and try again! Aside from renewed interest in paper straws (shout out to the paper mills! ), some companies are making washable, reusable drinking straws out of glass (?!) while other companies are scrambling to provide plastic straws that will decompose readily after use. Many large municipalities have since banned all non-biodegradable plastic drinking straws in an attempt to decrease the amount of plastic making its way into our environment, where it is pretty much indestructible. According to National Geographic, the ancient Sumerians submerged long-thin tubes made from precious metals into jars of beer, in order to get to the good stuff submerged beneath the floating fermentation byproducts. The paper straw was invented in 1880 by a man having difficulty drinking his mint julep through a piece of rye grass (you can’t make this stuff up). Bendable straws were invented in the 1930’s and quickly adopted by hospitals, as they allowed patients to drink while lying in bed. The 1960’s brought about wide-scale commercial production of plastic straws, despite my grade school lagging behind in their implementation. The 80’s brought us the crazy straw and other variants, and it is now estimated that the U.S. uses a half-billion straws every day. There are many different sources of feedstock that can be used for bioplastic production, each with advantages and limitations. Most feedstock is plant-based, with sources ranging from corn and algae to agricultural waste. Currently, the majority of bioplastics are made from starch, as it is inexpensive and abundant, but it has degradation and heat-stability issues. Other processes ferment plant-based sugars or oils to produce bioplastic precursors, which are then synthesized into polymers. Many bioplastics can then be processed using the same equipment used to manufacture synthetic polymers, such as injection molding, blow molding, and extrusion processes. Metal hoses and expansion joints can be found throughout bioplastics facilities. Stripwound hoses are used for pneumatic transfer of grains, powders, catalysts, and resin pellets. 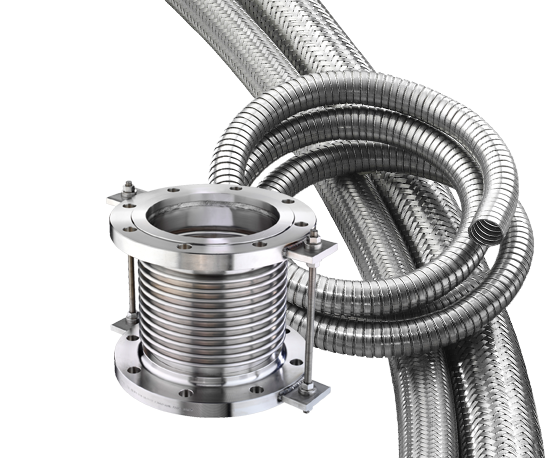 Expansion joints are used in steam lines, fermentation tanks, drying and pelletizing systems, and power generator exhaust systems. Corrugated hoses are used to supply heating fluid (typically steam or hot oil) to the extrusion equipment.